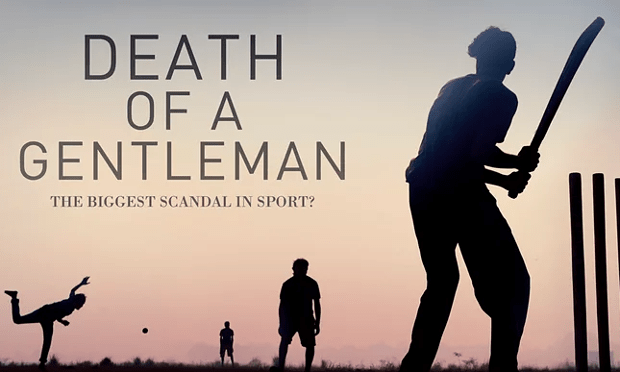 Death of a Gentlemen is a film created by two cricket lovers – Sam Collins and Jarrod Kimber – about the power and greed that has become deep rooted within the administration of the game. Throughout the film their passion for cricket is obvious and I quickly became aware that all Sam and Jarrod were trying to do was expose the truth from underneath the wall of lies that we as the general public keep being fed about cricket administrators being there to serve the game of cricket. The reality is that they are to serve themselves and the game of cricket is simply secondary. For those of you reading this who are unaware of the current situation within cricket administration, let me explain it in the simplest way possible. Essentially there are three main boards representing what may be referred to as the “Big Three” in cricketing terms – England, Australia and India. Now some people may argue that the better you are at something, the more rewards you should get from it, increasing the cricket odds in your favor. There is a massive flaw with this argument. The other boards of the nations who play Test Cricket such as West Indies and Pakistan are left to rot due to the lack of money. As a result, these nations play less Test cricket because there is no appetite from the “Big Three” countries to play teams with not only inferior players but inferior infrastructure. This means that in countries such as the West Indies who produced one of the greatest cricketing sides of all tie and love cricket, the public are not able to watch any Test cricket. Now the administrators will turn around and say that Test Cricket will survive as long as the “Big Three” keep pumping money into it. This is simply not true. Test cricket willl only survive if the public still have a desire to watch it. Therefore, the division of money in the game needs to be fairer than it is currently so that West Indies can attract bigger audices from within their own country when touring teams come over such as England did in 2014. One of my main bugbears in the game of cricket is that administrators moan about viewer numbers constantly going down and yet they do not realise that this is due to the fact that so many of the world class players are away playing in the IPL earning mega bucks when they should be playing for their Test sides. Now you might be reading this wondering what the IPL has to do with the administration of Test cricket. Well heres your answer. The former president of the BCCI N Srinivasan was owner of IPL franchise Chennai Super Kings as well as the MD of their main sponsor India Cements. Therefore, I would argue that this has led Srinivasan to have a conflict of interest – does he look after the Test cricket of India or his precious IPL franchise. It seems that he chose IPL over Test Cricket. As well as this, it is important to remember that when the cricket world clamoured for reforms, reforms were made but these were directly opposing the ones wanted by the cricket public. The reforms that were made led to the centralisation of money divided between the “Big Three” that I mentioned right at the beginning of this article. This has led to the steady decline in Test cricket terms of the rest of the nations who are now forced to play almost “mickey mouse” Test series of two or three Tests because the big series are left to the “Big Three” to play out. So, what I’m trying to say is that there needs to be a drastic change from cricket administrators such as Srinivasan and former ECB president Giles Clarke away from the attitude of ‘As long as we are ok, no one else matters’ and ‘if we can survive the hard times, the other nations can too’. Test Cricket is a world game and therefore we need to get the message across that we need to look after the whole world rather than the biggest parts of it and ensure that Test Cricket thrives again because if we keep letting the “Big Three” dominate Test Cricket then I strongly believe this age-old form of cricket will die a slow and painful death. During the olden days due to the inadequate supply of accessories such as Cricket Shoes, bats and gloves were the main issues but now its the dominance of other games which is shadowing over the Gentleman’s game inevitable making it fade its significance.